Supposedly only 24 units will be produced, so good luck spotting one in the wild… the 2019 Hennessey Goliath. 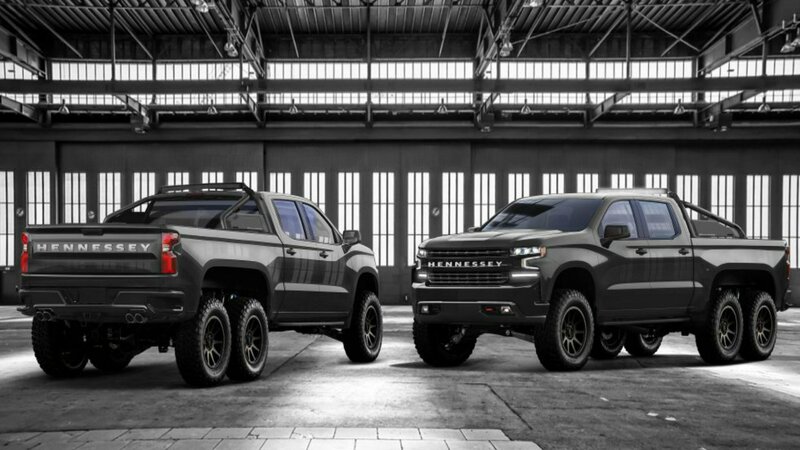 It’s not often that we associate a 2019 Chevy Silverado with having six wheels, 800 horsepower, and a $375,000 price tag, but that’s exactly what Hennessey has created with its newest monster: the 2019 Hennessey Goliath 6×6. Got an extra $375,00 to spare? Call our Customer Care Team at 630-898-9630 and we will be happy to arrange delivery of your Hennessey Goliath Silverado. The Texan tuning company has managed to build the ultimate off-road variant of the all-new 2019 Chevrolet Silverado Trail Boss Z71, exactly like they did with the Ford F-150 based Hennessey VelociRaptor 6×6. Under the hood, Hennessey worked its magic on the stock 6.2-liter V-8 which pumps out 420 horsepower and 460 pound-feet of torque by adding its HPE700 upgrade, which adds a massive 2.9-liter supercharger that produces 7 psi of boost. The end result is a staggering 705 horsepower and 675 pound-feet of torque. However, folks who aren’t satisfied with the 705-horsepower V-8 will have the option to upgrade to an 808-horsepower stroker motor—and hopefully, that will do the trick. The Goliath 6×6 is fitted with a host of visual and performance upgrades, most notable of which is the addition of a third axle and an 8-inch suspension lift. Additionally, the Goliath also gets 20-inch wheels wrapped with 37-inch BF Goodrich off-road tires, a custom bed-mounted roll bar with an LED light bar, and new bumpers at the front and back. Additional options include a Brembo brake setup and custom interior features that enable customers to make their Goliath 6×6 truly their own. Even with the additional weight of the third axle, Hennessey expects that the Goliath will be able to accelerate from zero to 60 somewhere in the four-second range. The vehicular monstrosity has a starting price of $375,000, but the good news is that the eye-watering price tag also covers the cost of the 2019 Chevrolet Silverado Trail Boss donor truck and comes with a 3-year/36,000 mile warranty. See, it’s not that bad. 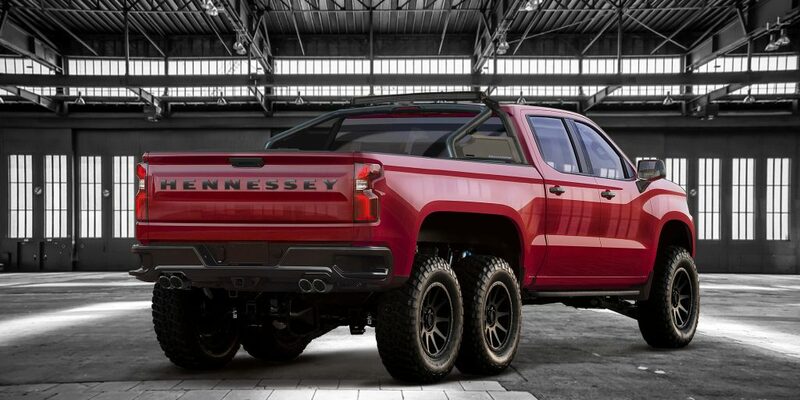 If you are currently in the market for a six-wheeled, supercharged pickup truck with up to 808 horsepower, you better act quickly because Hennessey is only planning on building 24 copies and once they’re gone, they’re gone. Bask in the glory of an odometer passing the half-million mark. A Chevy Silverado hit the milestone of half a million miles, and thanks to YouTube, you can catch the climactic moment. The video shows the truck’s odometer rolling over to the magic 500,000 milestone, with “great rejoicing” from the driver and passenger. Want your own Chevy pickup truck? Visit Ron Westphal Chevy in Aurora, IL. Call our Customer Care Team now at 630-898-9630 or Visit us ONLINE. 500,000 miles sounds like a lot — because it is — but it’s more impressive within the context of how far this car has traveled. The Silverado could’ve made the 3,312-mile trip from Caribou, Maine, to San Diego, California, nearly 151 times. It would’ve finished the length of the Trans-Siberian Railway 81 times. It could have traveled from Tunis, Tunisia, down the entire length of Africa to Capetown 72 times. It’s accomplished 45 laps of the Great Wall of China. If it traveled around the Earth at the equator, it could circle the globe 20 times. But all these trips are small steps. This Chevy could’ve made a giant leap for truck kind and make the trip to the Moon and back. Well done, Silverado. You deserve that cupcake.